I finally had my first shift today (since my first 2 got canceled). It was a transport shift, which isn’t as fun as the sporting events but still very useful information for us to gather. I was at the Media Village, which is where most of the media stays and is a major connecting point for all buses. About an hour into my shift, it started to get really windy. I figured it would pass, no big deal. 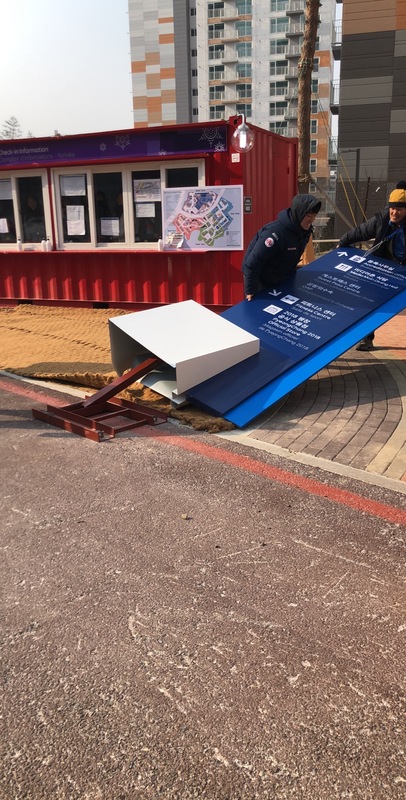 However, as the day went on, the wind got worse and worse, to the point where the fence and signs were starting to sway and metal trash cans were blowing away. I did my best to hide out from the wind, but it was a long day of dirt blowing into my face. 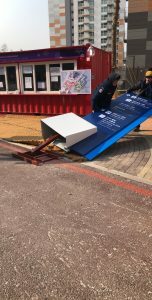 Right at the end of my shift, one of the big metal signs actually ended up falling over. I couldn’t believe that something cemented into the ground actually fell in front of my eyes! Luckily, no one was too close and no one got hurt, but it could have been a very different scenario had someone happened to be walking by at that moment! When I got home, I was coated in a layer of dirt, but happy to have worked my first shift.